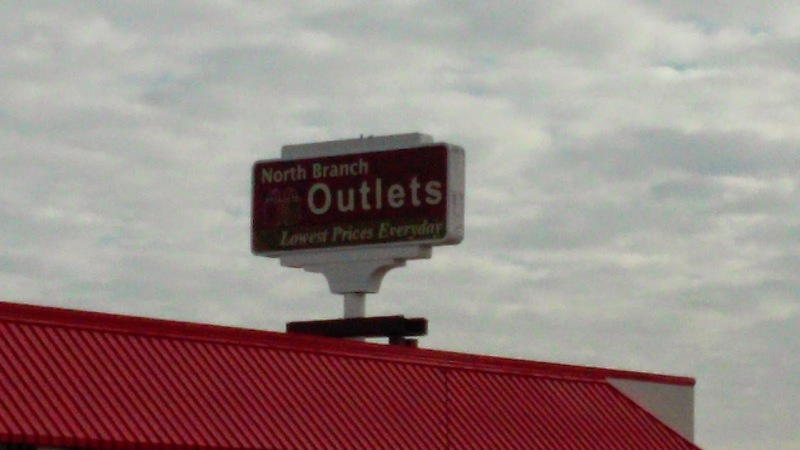 Today we went to the outlets in North Branch to get some measuring cups and check out the stores. We found some good stuff! Store one was Oshkosh. We found some lined overalls for Z on clearance so we got a few pairs. Ok we got 1 18 month, 2 24 month, 1 3T, and 1 4T. 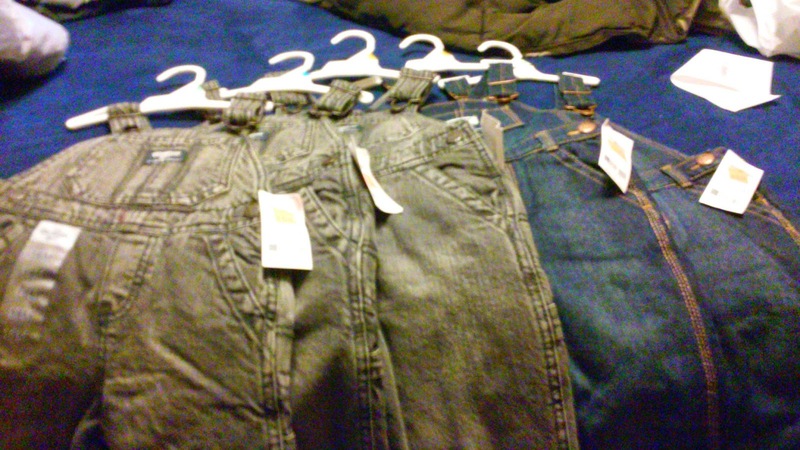 The only reason why we stocked up was because they were only $7.19 each so 5 pair of overalls for $35.95. Then it was the Kitchen Collection for the measuring cups which was a 19 piece set for $9.99. We love these measuring cups because it goes up to 2 cups and sometimes you don't want to measure twice. 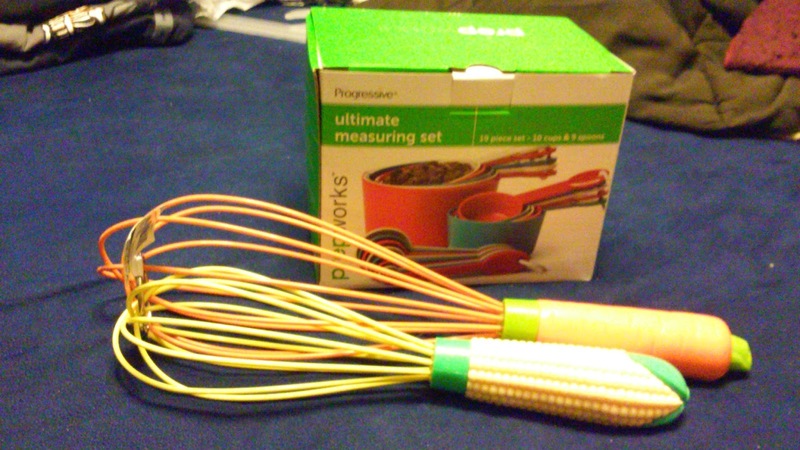 We also got a 2 whisk set for $5.00 that is a carrot and corn cob and we thought that they were cute lol. 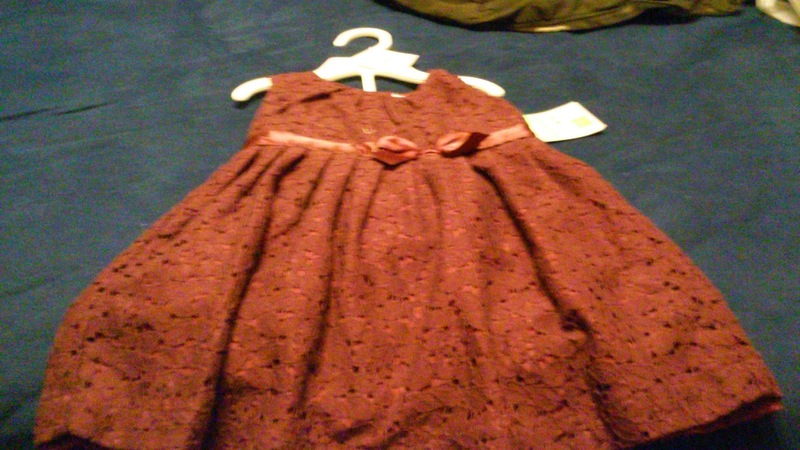 Carter's was next and we found Z's Easter dress on clearance for $13.59. With all the trouble we had trying to find a reasonably priced Christmas dress for her we had to buy it now or we would have trouble later. I have no clue why girls need holiday dressed but D says that they do so I just agree with it and let him buy one lol. We got Z's next pair of shoes at Famous Footwear because they were cheap as in $5.00 cheap. 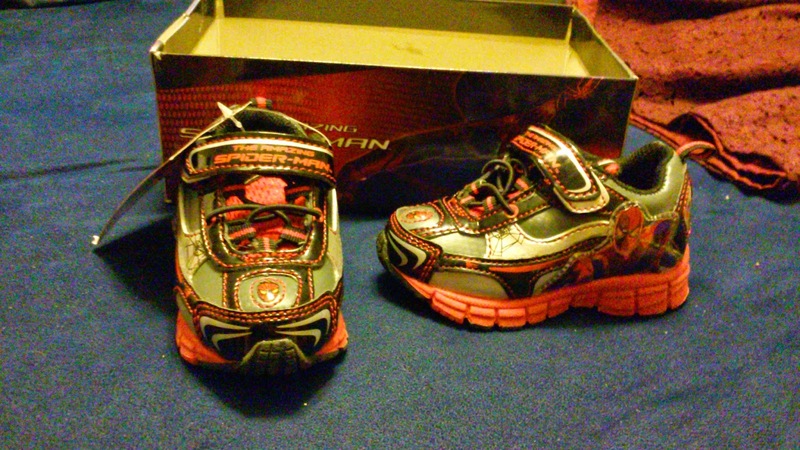 She is now the proud owner of light up spiderman shoes. Not very girly but they fit in our budget. I couldn't believe that they had infant shoes that they wanted $50 or more for when the kid is just going to grow out of them in 3 months. I stopped into Rue 21 next to buy some undies. No I won't share a pic of those but they do sell 5 pair for $7.50. 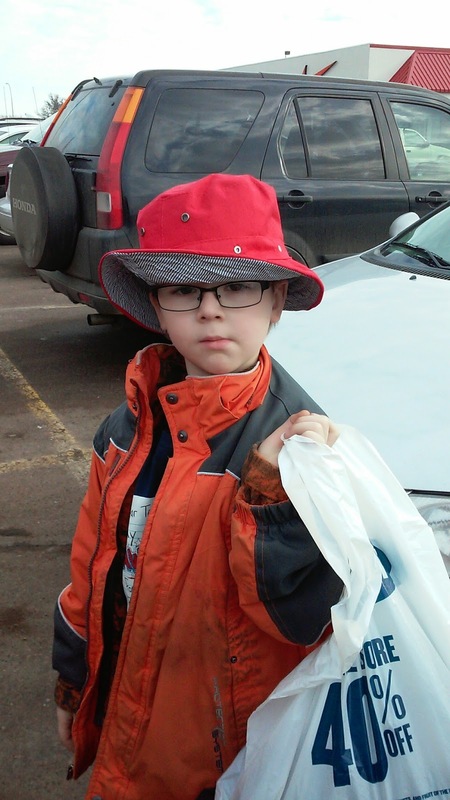 I will share the pic of the bucket hat we bought for G there for $3.00. The last store we stopped at was Old Navy. They are closing that location so if you want some good deals check them out. 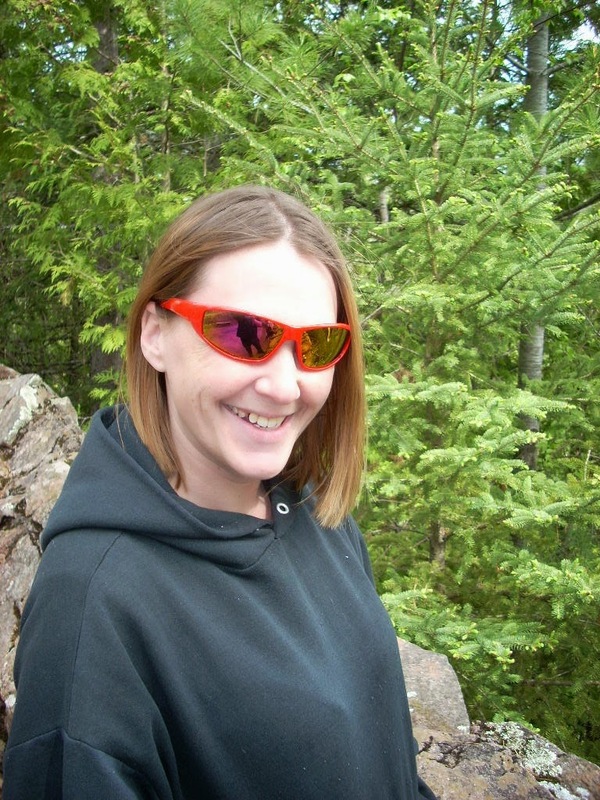 Keep in mind that they are closing at the end of the month and it is very picked over. 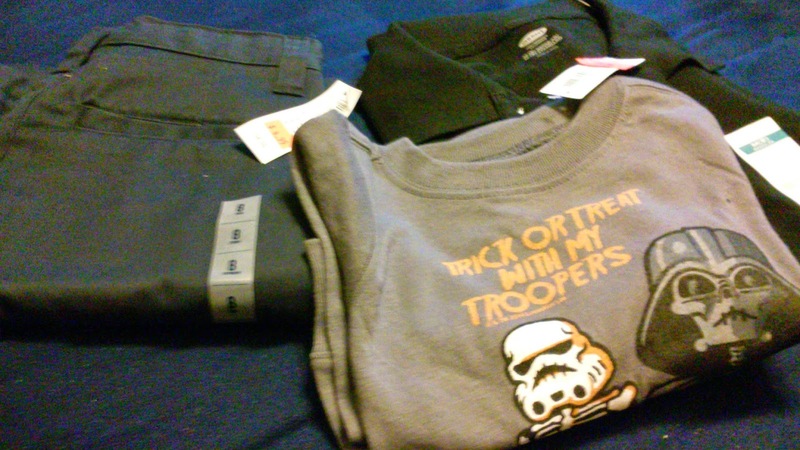 I got a black polo for G for $1.99, blue dress pants for G for $2.49, and a Star Wars tee for Z for $1.24. The Star Wars tee is Halloweenish but who cares its Star Wars lol. I think that we had a good shopping trip. All of that was only $86.78. I would say thats all we spent but when you figure in fuel and lunch it was probably more like $150. We could have had a cheaper lunch that we did but sometimes it is fun to splurge a little. 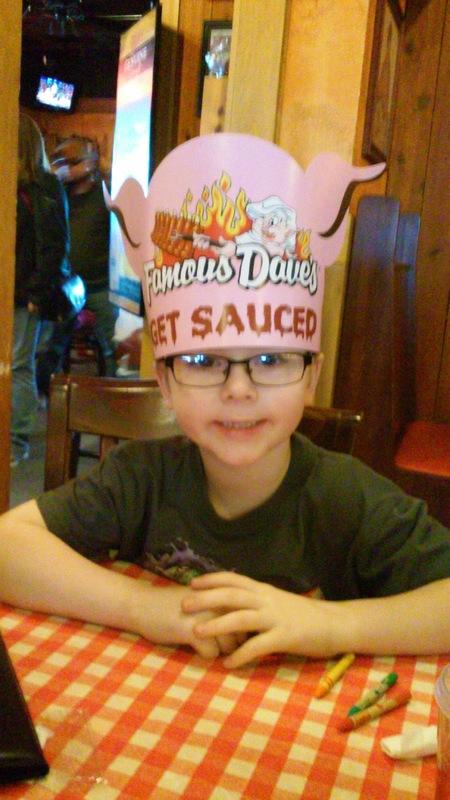 So we had Famous Daves for lunch. G is a huge fan of the Sweet and Zesty BBQ sauce that they have and yes, I know that you can get it at the grocery store because I have 5 bottles of it lol. But, like I said eating out is a treat sometimes. I had a productive day because with D driving I got in some serious sock knitting time in. 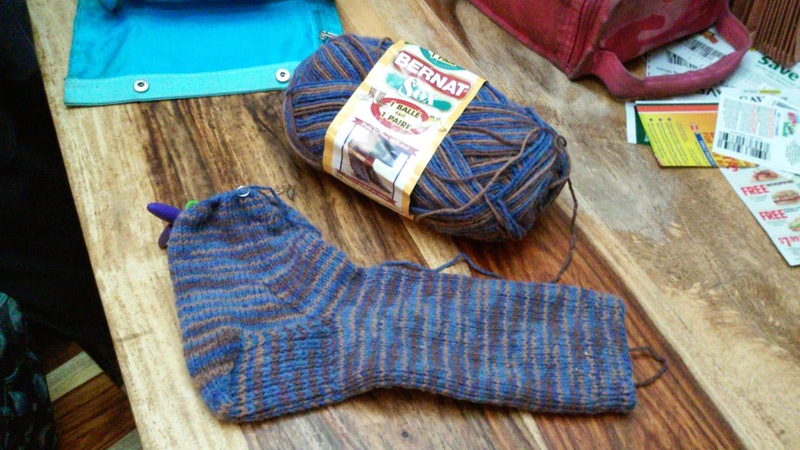 I am past the heel and trucking along on the foot of my 3rd of 20 socks that I hope to get done in 2015. This one will be given (along with its mate) to K for his 15th birthday in April. He is a huge fan of knitted socks and his feet grew so much last year that he only has 2 pairs that fit at the moment. I managed to road trip and get some serious shopping done without smoking so I almost believe that I have finally kicked this nasty habit. I would say that I have but if you ask anyone who has ever been a smoker they will tell you that cravings can show up at any time so for now I am just going to say that I am doing well with my quit and have made it 25 days. Wow! You had some fabulous finds from your outlet shopping trip! I never have shopping "success" like that. Sounds like you had fun too! I love the kitchen gadgets (aside from stationary, that's a big love of mine)! I love it when I get a good clearance score.